96Boards STM32 Sensor Mezzanine is based on the ST Microelectronics STM32F446VE Cortex M4 CPU. This board acts as a mezzanine platform for all 96Boards CE compliant boards. It can also be used as a standalone board. 96Boards STM32 Sensor Mezzanine can be driven by an internal oscillator as well as the main PLL clock. In default board configuration, the 16MHz external oscillator is used to drive the main PLL clock to generate a System Clock (SYSCLK) at 84MHz. On the bus side, AHB/APB2 clocks runs at 84MHz, while APB1 clock runs at 42MHz. On 96Boards STM32 Sensor Mezzanine, Zephyr console output is assigned to UART4 exposed via on-board Micro USB connector. Default settings are 115200 8N1. I2C2 goes to the Groove connectors and can be used to attach external sensors. 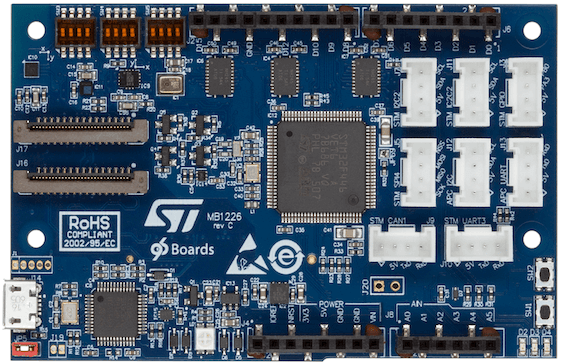 96Boards STM32 Sensor Mezzanine board includes an ST-LINK/V2-1 embedded debug tool interface. This interface is supported by the openocd version included in the Zephyr SDK. Run a serial host program to connect with your 96Boards STM32 Sensor Mezzanine board.